A duck coop with a ramp. Ducks are an entertaining and relatively low-maintenance addition to any homestead. They may make a mess with mud and water, but they are generally charming, hardy against the elements, and prolific layers of rich, delicious eggs. Once you’ve decided to raise ducks and procured your perfect breed, it’s time to set up a home for your feathered friends. Since ducks roost on the ground and chickens prefer to roost higher up, the two fowl can live peaceably. Wilson still suggests keeping them separate because of “the cleanliness factor.” “Chickens like to pick at the ground, and ducks will make the ground very wet,” Wilson said. Finally, predator-proof your duck house with secure window openings covered with hardware cloth wire mesh. (It is more secure than chicken wire, which is easily broken into by egg-thieving raccoons.) At night, either keep them in a closed coop or a securely fenced duck pen that can keep predators out. 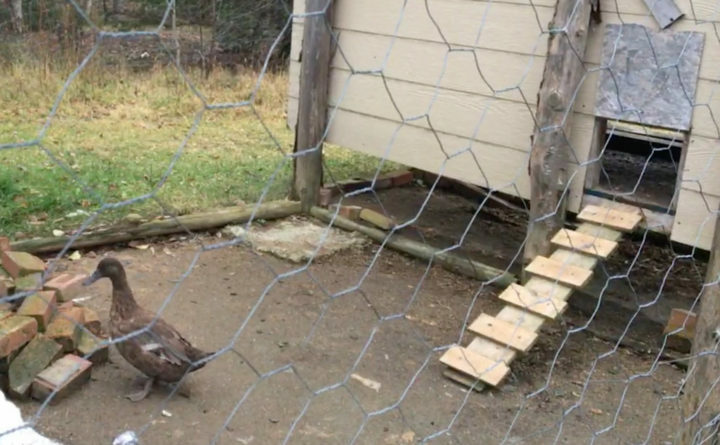 As much as you enjoy your ducks, foxes and large birds will enjoy them even more; a secure enclosure will keep your ducks out of their natural predators’ clutches.